édité le 12/04/2018 - Plus de news de "ExxonMobil" - Voir la fiche entreprise de "ExxonMobil"
Exxon Mobil Corporation announced that the size of the natural gas resource at the P’nyang field in Papua New Guinea has increased to 4.36 trillion cubic feet of gas, an 84 percent increase from a previous assessment completed in 2012. The increase supports a potential significant expansion of operations in the country. The independent recertification study by Netherland Sewell and Associates follows the successful completion in January of the P’nyang South-2 well, located in the Western Province of Papua New Guinea. 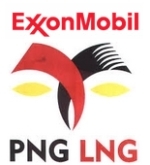 The results support ExxonMobil’s discussions with its joint venture partners on a three-train expansion concept for the PNG LNG liquefied natural gas (LNG) plant near Port Moresby, with one new train dedicated to gas from the P’nyang and PNG LNG fields and two trains dedicated to gas associated with the Papua LNG project. The development concept, which would add approximately 8 million tons of LNG annually, would double the capacity of the existing LNG plant operated by ExxonMobil. “This investment would extend our gas pipeline infrastructure into the country’s Western Province and have a meaningful and lasting economic impact for Papua New Guinea and its people,” Mallon said. The P’nyang field is located within petroleum retention license 3, which covers 105,000 acres (425 square kilometers). ExxonMobil affiliates operate the license with a 49 percent interest in the block. Affiliates of Oil Search have a 38.5 percent interest and JX Nippon has 12.5 percent interest. Papua LNG is seeking to commercialize the Elk-Antelope fields located in petroleum retention license 15 in the Gulf Province of Papua New Guinea. An ExxonMobil affiliate holds 37.1 percent interest, and affiliates of operator Total S.A. and Oil Search Limited have 40.1 percent and 22.8 percent interest, respectively. ExxonMobil (NYSE:XOM), the largest publicly traded international oil and gas company, uses technology and innovation to help meet the world’s growing energy needs. ExxonMobil holds an industry-leading inventory of resources, is among the largest refiners and marketers of petroleum products and its chemical company is one of the largest in the world.